An Apple a day will help keep your spelling woes at bay! Apples is different than any other spelling program out there, taking into consideration the unique needs of poor spellers. Once a week your student is introduced to a spelling rule (called a clue). He will study that rule for the entire week, applying it in all kinds of spelling situations: puzzles, fill-in-th-blank, complete-the-Bible-verse, etc. Some of the clues break a word down into syllables. An Apple a day will help keep your spelling woes at bay! Apples is different than any other spelling program out there, taking into consideration the unique needs of poor spellers. Once a week your student is introduced to a spelling rule (called a clue). He will study that rule for the entire week, applying it in all kinds of spelling situations: puzzles, fill-in-th-blank, complete-the-Bible-verse, etc. Some of the clues break a word down into syllables. For example, your student will be taught that the syllable that sounds like "-shun" is usually spelled "-tion." (Exceptions are addressed as well.) Your student will then apply that rule over and over in many different ways: action, motion, redemption, caution, etc. Apples builds another important skill in poor spellers. A good speller can look at a word, and even if they aren't sure how to spell it, they know it doesn't "look" right. Apples introduces your student to this skill by teaching them to recognize mispelled words in sentences with carefully-controlled vocabulary and specific rules. Possibly for the first time in his life, your student will be taught to recognize when a word doesn't "look right" - and if your student is like mine, that's a skill he really needs! What’s the difference between Apples and Apples 2? Apples 2 Daily Spelling Drills for Secondary Students follows the same format as the original Apples. Apples 2 provides practice to aid memorization of words that do not follow a rule (especially long-vowel words). It also incorporates innovative, real-life exercises such as check writing (for the spelling of numbers) and addressing envelopes (for common abbreviations and punctuation in addresses). A unique aspect of Apples 2 is that it takes into consideration that a poor speller needs repetition and reinforcement. 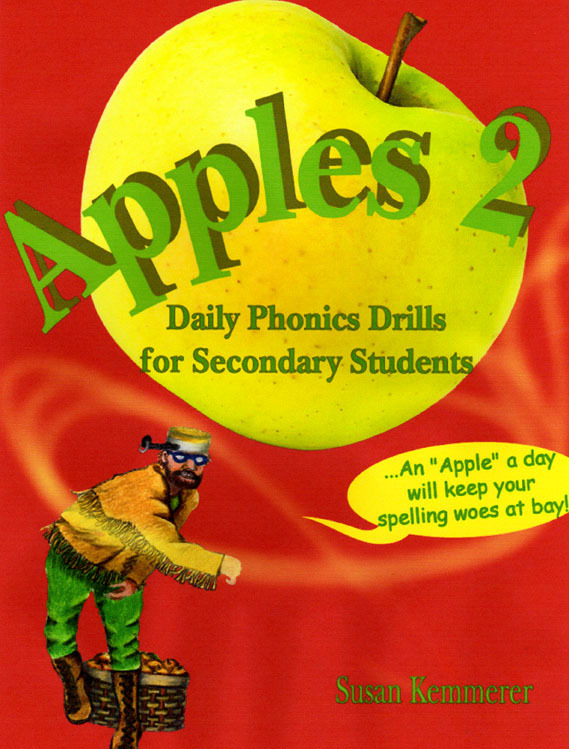 While other spelling programs rush on to introduce new material, Apples 2 reinforces some of the lessons from Apples (about 1/3 of the book repeats difficult rules from the previous year - giving poor spellers the valuable reinforcement they need), while also introducing the student to a number of new phonics rules. In many spelling situations, a hard and fast rule doesn’t exist, and simple repetition and memorization is necessary. Apples 2 exposes the student to these situations through drill work in the form of puzzles, Bible verses, and fill-in-the-blank exercises. Everything you need is included – even a convenient answer key and a helps section. These daily drills will help your student memorize the spellings of common words in a low-stress, non-threatening, manner. By the end of the year with the help of daily Apples and Apples 2, I had seen dramatic improvement in my sons’ spelling skills. I realize spelling will always be a struggle for my boys (some people will never be good spellers), but I believe they finally have the tools to overcome this struggle. Apples 2 is easy to use (no more than 10 minutes a day), and comes complete with an answer key and a list of spelling exceptions and tips in the back of the book. There are no extensive lists or tests to further demoralize the poor speller - just application of spelling rules in an encouraging Scripture-sentence-or-puzzle. Great follow-up to Apples 1. I used this for my middle son who struggles with a writing disability. Both Apples books helped him gain confidence and he was sorry when there wasn't a third book. It's such a simple format with a fun layout and painless way of learning. I plan on using it with my last son this fall. He's not that bad of a speller,but this course only takes a few minutes a day and will be a great review for him. By the way, thanks in part to SHP, my son with the learning disabilities is starting college this year. Thanks Susan!